For a list of games, see games with anti-aliasing (AA) support. 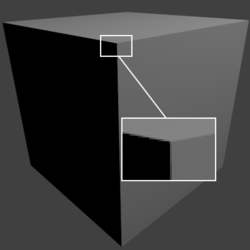 Anti-Aliasing (AA) is a computer graphics technique that attempts to minimise the unwanted 'staircase' or jagged object outlines which occur due to the limited resolution in 3D-Renderers, essentially by 'smoothing' these lines. There are a number of Anti-Aliasing techniques today but all of them are based on the same principle. They simply render multiple pixels per pixel of the final image. How they determine which pixels are aliased. How they "mix" the multiple rendered pixels to get the final pixel. Those algorithms are also variable on how many pixels they use to determine one final pixel. In video games this is represented by a simple number which is a power of 2 like 2x, 4x, 8x etc. There are several terms associated with Anti-Aliasing, most of which are derivatives on the standard Anti-Aliasing formula. 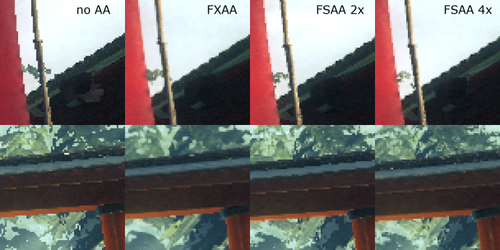 Also known as Full Scene Anti-Aliasing (FSAA) and often interchangeable with the term downscaling. Technically when implemented correctly, these do differ in that downscaling applies to an entire frame buffer – 2D and 3D Elements, while SSAA/MSAA are techniques only applied internally to 3D elements. In some implementations this can result in a lesser performance impact and better compatibility. Applies the general anti-aliasing formula to full screen images, reducing the "staircase effect". When compared to a rendered image undergoing MSAA, a SSAA/FSAA image will appear smoother. 2D text can also be affected by most downscaling implementations, while SSAA/MSAA should not affect text when implemented correctly. Has largely been replaced by less resource intense methods due to the huge stress it puts on the GPU, but due to the better result that it provides, some games still adopt it as an option in the in-game settings. To reduce the stress that SSAA/FSAA puts on a system, multi-sampling optimizes the process by evaluating each pixel only once, with true super-sampling only occurring at the edges of a rendered object, and to depth values. This results in a similar (but less drastic) improvement in visual quality whilst reducing the load put on the system to render and downscale such high resolutions. Primarily clears up aliasing on geometry; temporal aliasing and aliasing from shader effects, textures and transparencies will not be affected. According to Nvidia it reduces performance cost while used with high resolutions and is more flexible to needs of different game engines due to its programmability. One note of importance is that MFAA doesn't function properly below 40FPS. Below that threshold, MFAA causes smearing and blurring in motion. Aims to further reduce the additional stress that MSAA puts on the system, with Nvidia claiming that a CSAA-rendered image will rival 8x-16x MSAA whilst only putting a load on the system comparable to 4x MSAA. It does this by reducing the number of settings each sample determines (by creating a new sample for coverage) whilst increasing the overall number of samples. Improves on standard MSAA somewhat. For example, 2x QSAA roughly equates to 3x MSAA in terms of quality. 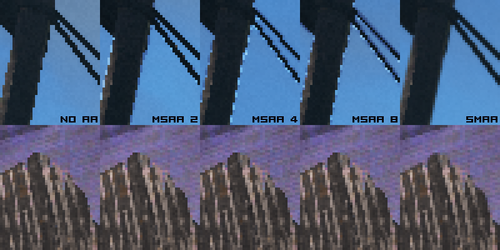 AMD claims it offers enhanced AA quality over standard Multi-Sample Anti-Aliasing modes by adding more coverage samples per pixel but keeping the same number of color/depth/stencil samples to achieve better AA quality than standard MSAA modes. Modern version of SSAA, possessing superior quality to other anti-aliasing methods at a steep performance cost. Comes in two forms: FSSGSSAA (Full Scene Sparse Grid Supersampling Anti-Aliasing) and TRSGSSAA (Transparency Sparse Grid Supersampling Anti-Aliasing). Transparency version is enabled simply by setting it in Nvidia control panel. Full Scene requires one to set Antialiasing - Mode to Override any application settings, Antialiasing - Setting to either 2x 4x or 8x multisapling and Antialiasing - Transparency to the same value you set Antialiasing - Setting. Note that your game may need a particular compatibility string, see here for more info; Nvidia Profile Inspector is needed. Applied after the image is rendered, unlike traditional methods. This means they are virtually compatible with every game, video or even still picture possible. Due to this, the image (textures in particular) can sometimes become blurry, so much that overall quality could become worse than the original if implemented poorly. Must be applied before rendering the HUD elements of a game, lest it affect them too. However, the image quality improvement it provides is significantly less impressive than traditional AA methods such as MSAA. Nvidia's response to AMD's MLAA. Available on AMD cards and can be forced for all games through the display driver control panel regardless of graphics API being used. Have a larger performance impact than FXAA. Compared to FXAA, CMAA provides significantly better image quality and temporal stability as it correctly handles edge lines up to 64 pixels long and is based on an algorithm that only handles symmetrical discontinuities in order to avoid unwanted blurring. Seek to mitigate the effects of temporal aliasing. Most methods cause significant blurring while in motion. Catchall term for various temporal methods. Combines the raw power of MSAA with sophisticated resolve filters similar to those employed in CG films to produce a smooth image. Applies anti-aliasing not only to the current frame but also to some frames that were rendered before, restoring the old positions of pixels by using their velocity. This creates smoother and more cinematic images in the game, while only slightly increasing the load on your video card. 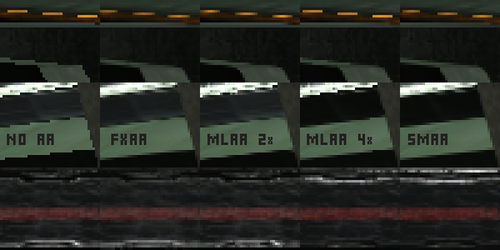 Reconstruction antialiasing attempt to reduce processing demands on the GPU by rendering at lower resolutions, then upscaling to the output resolution, antialiasing in the process. Emulates super-sampling by using a neural network to infer extra detail on top of the game's render by matching it to reference images rendered at 64x supersampling (64xSS). Reduces performance cost, as it uses only the Tensor Cores for the AA. DLSS uses 2/3 of the final resolution to render, and then upscales that to the full resolution. DLSS 2X is the only method that can render the game resolution the same as the output resolution. "One more rather important disadvantage is that, due to separating the lighting stage from the geometric stage, hardware anti-aliasing does not produce correct results anymore since interpolated subsamples would result in nonsensical position, normal, and tangent attributes." This page was last edited on 2 April 2019, at 19:01.